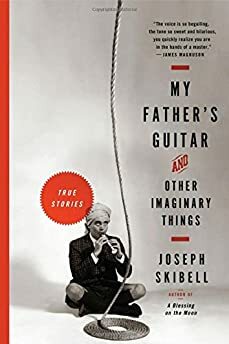 Largehearted Boy: Book Notes - Joseph Skibell "My Father's Guitar and Other Imaginary Things"
Book Notes - Joseph Skibell "My Father's Guitar and Other Imaginary Things"
Joseph Skibell's My Father's Guitar and Other Imaginary Things is a thought-provoking and moving memoir-in-essays. "A memoir/essay collection of consistently heartfelt and enlightening morsels of humanity." In June 2011, I found myself sitting at Pierre Bensusan's dinner table in Chateau-Thierry, a little medieval town outside of Paris. I was one of nine students who'd come to study with the great French guitarist for a week. Pierre and his wife Dorotea welcomed us graciously to their home, putting us up in the various rooms of their old farmhouse where they live. I'd never traveled overseas alone before. If you asked our friends, I'm sure they'd tell you that, of the two of us, my wife Barbara is the practical, levelheaded one. Usually, when she and I arrive somewhere, I'm overeager to leave the airport and get into town as quickly, as heedlessly, as possible. But now, traveling solo, I understood Barbara's reticence, her calm, slow sense of restraint. "Okay, okay," I told myself, "all you have to do is pick up your guitar and your bag at baggage claim. Proceed slowly and calmly. As long as you're in the airport, you'll be in a more or less Anglophonic environment. Ask for help if you need to, then make your way to the train station, purchase a ticket for la Gare du Nord. Move slowly and do not panic!" A complete amateur as a musician, I carried this feeling of being in over mon tête into dinner that night at the Bensusans', confessing to Pierre that I felt a little chagrined about having come all this way. "It's ridiculous. I mean, I feel like I've traveled halfway across the world to ask Mozart to teach me to whistle." "Why are you here then?" he asked me. "I don't know. I guess I'm impulsive," I said, and I suppose I am. Two summers before, based upon a total misapprehension, I set out on a road trip with my daughter Samantha across North America, visiting master guitar builders in search of my father's imaginary guitar. (It's too long a story to tell here, but you can read about it in the title piece of my new collection, My Father's Guitar and Other Imaginary Things.) As a result of that trip and over the course of the intervening years, I've acquired a number – there's no need to go into the exact number – of beautiful handmade guitars. I've played guitar since I was nine, taking my first lessons from a lanky hippie iconoclast named Spider Johnson at Harrod Music Co. in Lubbock, Texas. In my mid-20s, as I concentrated more on writing, I began playing less and less; and in the intervening years, my ear, I guess, became more sophisticated. Though, as a kid, I could sit for hours on my bedroom floor with my blue Fender Mustang pulled tightly against my chest, strumming "Ride, Captain, Ride" and Dan Fogelberg's "Part of the Plan," as an adult picking up the instrument again, I found I needed more of a musical challenge. Also, with these beautiful guitars in my possession, I had to up my game. Otherwise, it'd be too much like playing "Chopstix" on Steinway Grand. The week with Pierre, I'm happy to report, was transformative. Flying home, listening to my iPod, I could hear music – in fact, I could hear into music -- in a way I never had before. I began playing everyday again, just as I had as a kid, and the music I listened to while working on My Father's Guitar and Other Imaginary Things was really mostly the songs I was playing myself, and these included a number of pieces by Pierre. "Hymn 11" appears on Pierre's 2005 album Altiplanos. Although written ostensibly as a memorial to the martyrs of 9/11, the piece, Pierre told us in his sunny practice room, "is really about sustain." He meant sustain in a musical sense, of course. But here's a funny thing: there's no true legato on a guitar. Thanks to the frets, you can't actually connect one note to the next, but a guitarist can create the impression of legato by letting notes rings out -- or sustain -- as long as possible. "Hymn 11" begins with a quiet eight-note theme, the melody ascending and returning to the opening note before ascending higher. This is followed by a kind of meandering rumination. At times, you can hear a wedding march, at times a children's song, in the piece's hymn-like phrases. Despite its sonorous beauty as it moves into a majestic second part built upon a series of ringing open chords, despite the melody's tendency to ascend higher and higher, despite the song's having been composed in a major key, melancholy, mourning and sadness are unmistakable beneath the song's tender sense of joy. Even in the third part, a nine-bar dance with a light samba feel, the blue notes, a flatted 7th not quite making the ascent to the octave, temper the ecstasy while bringing a sweet, sultry edge into the dance. Having reached its climax, the dance takes a seven-note leap down, a descent that is somehow equally joyous and somber, dissolving into a restatement of the opening, played this time as a lullaby backed by chords that sound as though someone were placing his entire forearm against a piano's keyboard. The piece concludes with a four-chord statement that descends slowly but inevitably, a descent made bearable by the composer's sense of beauty and benediction. "Silent Passenger" (on the album Intuite) is probably my favorite of all Pierre's pieces, and certainly it's my favorite piece to play. It's hard to know exactly what the song is about, but the title is evocative: Who, I've always wonder, is driving – the piece's rolling quarter-note triplets bring to mind the feeling of a car trip through winding mountain roads – and who is the silent passenger? And why is the silent passenger silent? We all know that moment in a long car trip when the initial elation of setting out has passed, the conversation exhausts itself, and you and your companion stare out at the road in silence. But that moment is obviously not what this song, with its bright sense of wandering, is about. The score is too full of glissandos and tremolos and trills and appegiated runs for that, and all these little grace notes create a sense of, well, grace, a sense of continually slipping into place. And so who is the silent passenger? The soul is a traveler, according to the philosopher Gabriel Marcel. "It is of the soul and of the soul alone that we can say that being means being on the way." For me, that's what this song is about: the soul is the passenger within each of us, the stowaway who takes the trip with us, and whose silence, if we listen closely to it, is more profound than any music or words. Edgar Yipsel "Yip" Harburg was one of the writers of the Great American Songbook. Unlike many of the lyricists and composers of his time – most of them children of Jewish immigrants all living on the Lower East Side: George and Ira Gershwin, Jerome Kern, Lorenz Hart, Richard Rodgers, Irving Berlin, and Harold Arlen – Harburg was too poor to dedicate himself to songwriting. He was probably the only person in America who welcomed the Great Depression: it wiped out the little electrical appliance business he owned and set him free at last to follow his dream. Harburg wound up in Hollywood at one point, editing the final script and writing the lyrics for The Wizard of Oz. His musical collaborator, Harold Arlen, had had an aural revelation one evening driving down Sunset Boulevard with his wife behind the wheel. "Stop the car!" Arlen shouted at her. "I've got it!" His wife, the gorgeous showgirl Anya Taranda, pulled over right in front of Schwab's Drugstore. And it was there that Arlen wrote down the music he was hearing in his head, a big brassy show tune with an octave leap between the first two notes. Though it was already past midnight, the two dashed over to Harburg's house. "I've got the final number!" Arlen shouted. Sitting down at the piano, he banged out the chords, giving them a grand, symphonic sweep. "I don't hear it," Harburg said. "Not for our little Dorothy!" Arlen was certain this was the tune they needed to complete the score, and they decided to play the tune for Ira Gershwin, who lived nearby. "It's great," Gershwin said, "but stop banging it out. Play it as a ballad instead." Arlen toned it down. He played the piece with a gentle, simple elegance, and it became the song we all know today as "Over the Rainbow." Although we wouldn't know it today if the studio heads had gotten their way. "It's a love song sung to a dog by a teenager in a barnyard!" Louis B. Meyer told them. "There's no way it's staying in the picture." Harburg persisted, and Meyer ultimately relented, keeping the song in "as a favor for the boys." The guitarist Mark Hanson has a brilliant arrangement of the song for solo guitar (published in his Great American Songbook), which I've been working on for a while now. Hanson emphasizes the song's bitterness and its sense of outrage, qualities absent from, say, Bing Crosby's more sentimental version. Hanson adds in a bluesy minor-key rendition of "When Johnny Comes Marching Home" and the saddest version of "The Star-Spangled Banner" you'll ever heard in your life. But for some reason, he doesn't include the introduction, the segmented verse, the part that begins "They used to tell me I was building a dream/And so I followed the mob …" I love this part, and so I found the sheet music online. Employing all the musical theory I could recall from my childhood piano lessons, I transposed the intro's melody into the key Hanson uses, raised it an octave for the guitar, daubed some jazz chord around it and didn't do half a bad job, if I say so myself. The arrangement isn't difficult to play, but it's difficult to play with musicality, and I'm still working on memorizing the second half of the piece. There's music everywhere. During the 1960s, for instance, the Lubavitcher Rebbe sent two young rabbis out to college campuses in the US in the hopes of bringing disaffected Jews back into the fold. These two young Chabadniks, venturing out into the wilds of academia during this era of free love, psychedelic drugs and cultural syncretism, were Shlomo Carlebach and his brother-in-spiritual-mischief, Zalman Schachter (later Schachter-Shalomi). As it turned out, the young hippie college student seemed to have as much influence on these two "holy rascals" as the two of them had on the kids. In addition to being a congregational rabbi, a pastor, a counselor, a storyteller, and a theologian, Carlebach – it's well known – was a singer and a composer and basically a pop star. (His album At the Village Gate, released in 1963 on Vanguard, was in every household I knew as a kid and it's still in print.) Perhaps less well known is the fact that Reb Zalman, in addition to being all these other things, was, though not a pop star, a composer as well. I have gathered my myrrh and my spice. The voice of my beloved knocks. "Open to me, my sister, my love"
Kol dodi dofek, "Pitkhi li, akhoti, ra'yati. Kaplan adorns Reb Zalman's lovesick melody with McCoy Tyner-like jazz chord. Curious about the piece, I wrote Kaplan, asking about it, and he faxed me Reb Zalman's sheet music annotated with his own handwritten chord substitutions. The arrangement that emerged under my own playing is similar if not exactly the same – my ear isn't quite that good – but (I'm happy to say) it's pretty gorgeous nonetheless. Andres Segovia famously said that the guitar is a little orchestra, but as the jaw-droppingly amazing work of Michael Chapdelaine proves, it's also a rock ‘n' roll band. Somehow, the classically-trained Chapdelaine is able to play all the parts of various pop records on his lone solo guitar. Listen to his Chapdelaine's version of the Beatles' "Come Together" and "Something," for instance – he regularly posts videos on YouTube – and you'll hear Ringo's syncopated beats, McCartney's sinuous bass lines, and Harrison's (and/or Eric Clapton's) eloquent solos, along with the Beatles' complex vocal harmonies. Michael runs the guitar program at the University of New Mexico and I spent a week a few summers ago studying with him. He's a profound teacher, openhearted and generous. As a person, I'd characterize him as a transcendental hedonist, his head in the clouds of Buddhist knowing, his body planted firmly on the earth. When, for instance, I called to tell him I'd arrived in Santa Fe, where apparently he once lived, he told me, "I mourn for Santa Fe!" That's probably what makes him a great musician, I thought to myself. Because if someone mentioned Santa Fe to me, I might say, "Yeah, I lived in Northern New Mexico in the ‘80s, and I guess I kind of miss it." But Michael seemed to have no trouble expressing an unadulterated emotional truth. In any case, Michael's arrangement of "She's Leaving Home" is a miracle of compression. With only six strings to work with, he brings the song (as well as the Beatles' recording of it) to life. If you play it with a sensitive touch, you can hear not only Mike Leander's orchestral score with its opening harp figure, but also the gentle overlapping of McCartney and Lennon's vocal lines. On the video, Michael makes playing it look easy. At this point, I can barely scrap through it. Music fills the pages of My Father's Guitar and Other Imaginary Things as these days it fills my life. If I mourn Chapdelaine-like for anything, it's for the 20-odd years I let my guitar gather dust in a corner of the room. It was worth it, I suppose. I'm happy being a writer. Still, it seems to me, that's the problem with life: we all have too many lives to live and only one life to fit them into. I could go on and on about this, but for now, anyway, it's time to get back to my playing.